In celebration of his first paycheck (and the fact that we didn’t go broke waiting for it), Nick requested a chocolate 6-layer cake. Since he hardly ever asks for anything except pizza and pancakes, I was happy to oblige. The chocolate butter cake and the silk meringue buttercream are both recipes from this book, and the filling is a simple chocolate mousse. I topped it with a few milk chocolate curls, which were not quite as easy to make as the youtube video promised. I’ve made a few cakes in my day, and most have been both pretty tasty and pretty ugly. I can dedicate hours to baking and mixing up fillings and icings, but by the time I get to cake construction, I am usually in a hurry to be done and I do a rushed job. Tired of my usual “rustic” icing application, I decided to put some effort into it. I am pleased as punch with the results. I’m thinking I should invest in a lazy susan so I can achieve an even cleaner icing application, but it hasn’t been quite long enough since I’ve packed and unpacked my entire kitchen before I can add another item to the collection. 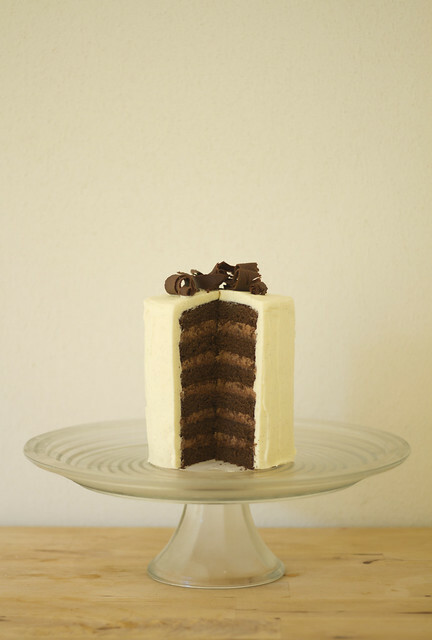 My newly discovered cake-making skills have me itching to make another– anybody got a birthday coming up? Posted on September 29, 2012 by Jessica This entry was posted in Food, Life. Bookmark the permalink. Jess, this cake is beautiful! All of my cake endeavors end with me covered in sweat, palms clammy, clinging onto my frosting spatula taking bit after bit of frosting off in an attempt to make it even. Then eventually, I end with an uncomfortably thin layer of frosting on my cake. So I add another layer (after chilling, of course) and the cycle continues. Which is why I stick with cupcakes. Frosting cupcakes is easy and consistent and most importantly, sweat free. thanks, mel! you just described my usual cake-frosting process– this time i somehow found a good stopping point before it got out of hand.